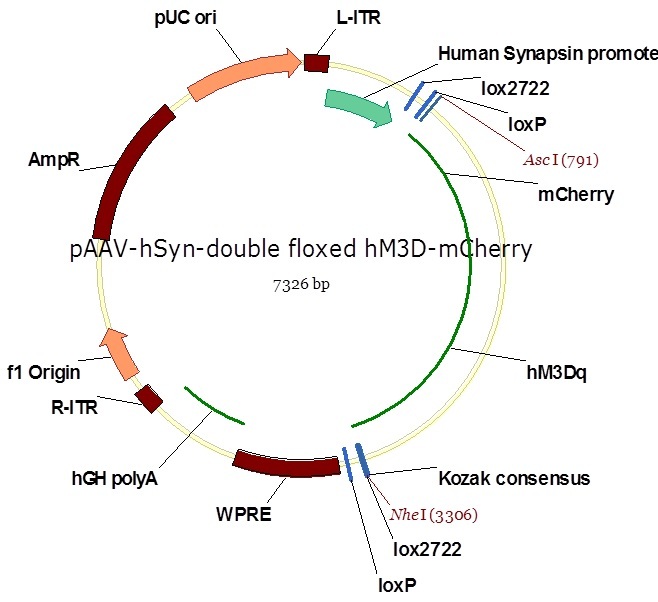 Double floxed Gq-coupled hM3D DREADD fused with mCherry under the control of human synapsin promoter. Ready-to-use AAV2 particles produced from pAAV-hSyn-DIO-hM3D(Gq)-mCherry (#44361). 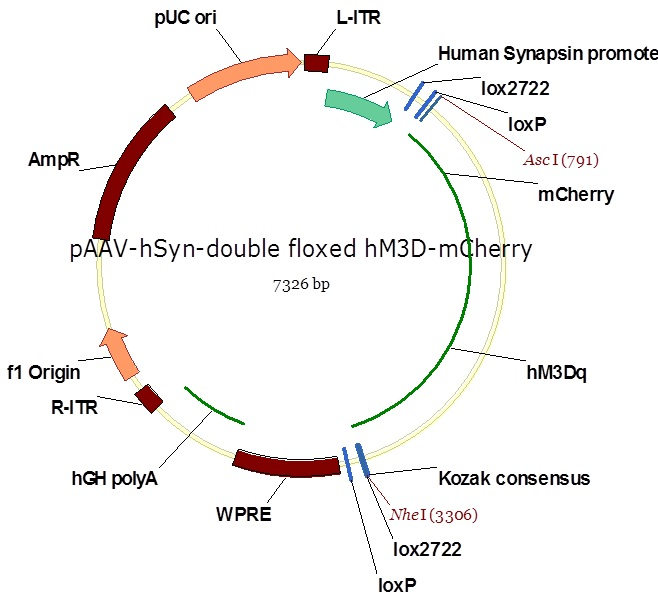 In addition to the viral particles, you will also receive purified pAAV-hSyn-DIO-hM3D(Gq)-mCherry plasmid DNA. Ready-to-use AAV5 particles produced from pAAV-hSyn-DIO-hM3D(Gq)-mCherry (#44361). In addition to the viral particles, you will also receive purified pAAV-hSyn-DIO-hM3D(Gq)-mCherry plasmid DNA. Ready-to-use AAV8 particles produced from pAAV-hSyn-DIO-hM3D(Gq)-mCherry (#44361). In addition to the viral particles, you will also receive purified pAAV-hSyn-DIO-hM3D(Gq)-mCherry plasmid DNA. Ready-to-use AAV9 particles produced from pAAV-hSyn-DIO-hM3D(Gq)-mCherry (#44361). In addition to the viral particles, you will also receive purified pAAV-hSyn-DIO-hM3D(Gq)-mCherry plasmid DNA. 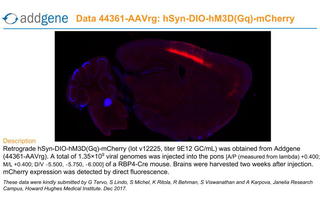 Ready-to-use AAV Retrograde particles produced from pAAV-hSyn-DIO-hM3D(Gq)-mCherry (#44361). In addition to the viral particles, you will also receive purified pAAV-hSyn-DIO-hM3D(Gq)-mCherry plasmid DNA. 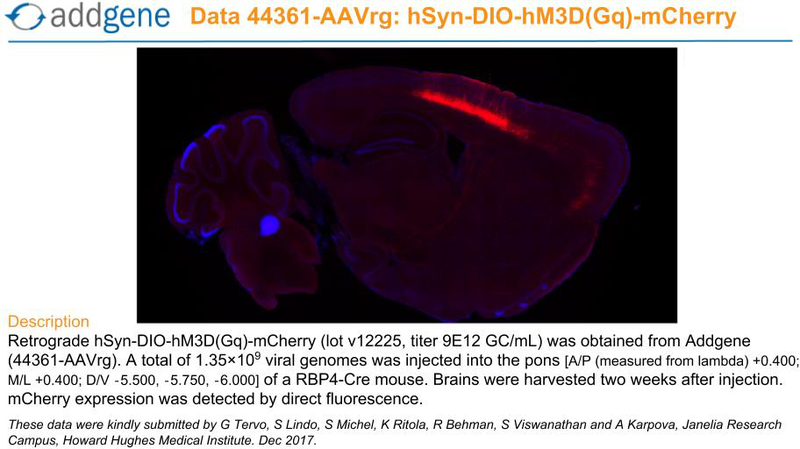 Syn-driven, Cre-dependent, hM3D(Gq) receptor with an mCherry reporter for CNO-induced neuronal activation. 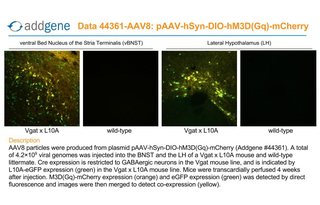 These AAV were produced with a retrograde serotype, which permits retrograde access to projection neurons. These AAV preparations are suitable purity for injection into animals. 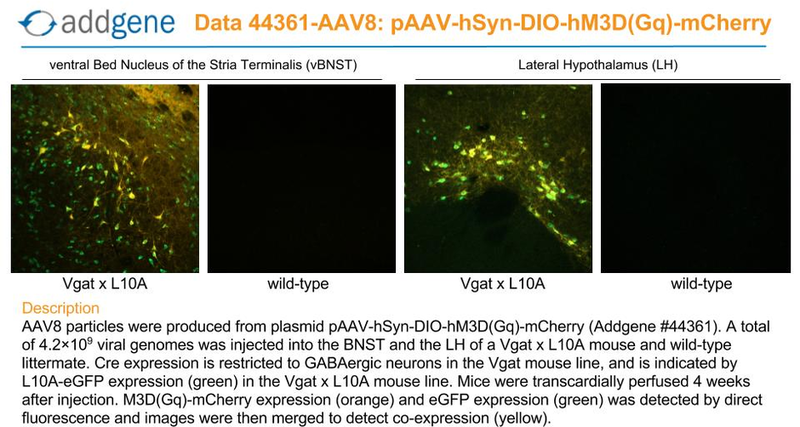 Ready-to-use AAV PHP.eB particles produced from pAAV-hSyn-DIO-hM3D(Gq)-mCherry (#44361). 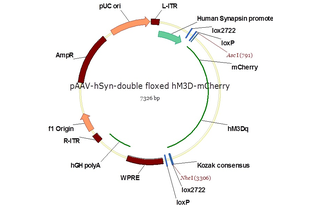 In addition to the viral particles, you will also receive purified pAAV-hSyn-DIO-hM3D(Gq)-mCherry plasmid DNA. 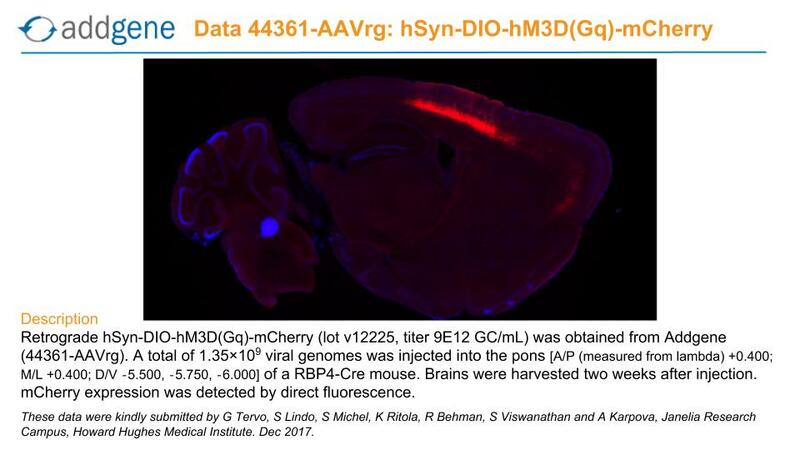 Syn-driven, Cre-dependent, hM3D(Gq) receptor with an mCherry reporter for CNO-induced neuronal activation. 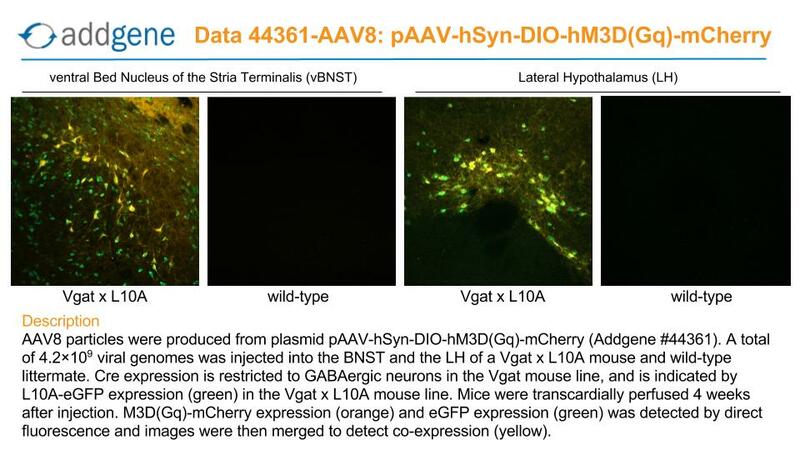 These AAV were produced with the PHP.eB serotype, which permits efficient transduction of the central nervous system. These AAV preparations are suitable purity for injection into animals.